Helen Rae Smeltzer - age 98, of Wolfville, formerly of Kentville, passed away on Tuesday, April 9, 2019 in the Wolfville Nursing Home. Born in Scotsburn, she was the youngest daughter of the late John and Cora (Rae) Campbell. She was a member of Bethel Presbyterian Church, Scotsburn and was an associate member of the Kentville United Baptist Church where she was active in the Dorcas Society, quilting group and Ladies Auxiliary. 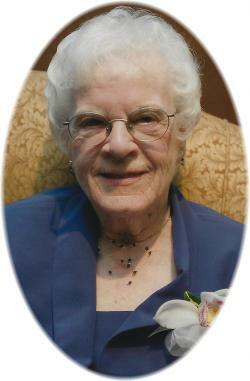 She was an avid quilter and enjoyed many crafts with the Hobby Crafters. She worked for Foundation Maritime in Pictou in her earlier years. She married her husband, Gerry, and moved to Kentville. For 53 years, the two of them ran a successful honey business and jointly received recognition from the Canadian Honey Council. She is survived by her children, Gary, Shubenacadie; Nancy (Barry) Maxner, Windsor; grandchildren, Anne Higgins, Calgary, Alberta; Beth Higgins, St. John’s, Newfoundland; Amy (Peter) Bienkowski, Ottawa, Ontario; John (Heather) Maxner, Airdrie, Alberta; Andrew (Charlotte) Maxner, New Plymouth, New Zealand; Janet (Josh) Redden, Windsor; great-grandchildren, William and Nina Bienkowski; Charlie, Emily and Lucy Maxner; Leah and Megan Redden, all at home; son-in-law, Terry Higgins, Halifax; nieces and nephews. She was predeceased by her husband, Gerald "Gerry"; daughter, Margaret Higgins; sisters, Margaret Campbell and Marion (Ian) MacDonald. Visitation will be held from 6:00-8:00 p.m. on Friday, April 19, 2019 in the White Family Funeral Home, Kentville, where the funeral service, followed by a reception, will take place at 1:00 p.m. on Saturday, April 20, 2019, Reverend Elizabeth Johnson officiating. Burial will take place in the Lakeview Cemetery, Upper Vaughan, Hants County, Nova Scotia. In lieu of flowers, donations in memory may be made to the Multiple Sclerosis Society of Canada (Atlantic) or a charity of your choice. Funeral arrangements have been entrusted to the White Family Funeral Home and Cremation Services, Kentville.